CES 2017: Samsung to launch personalised smart TV services | What Hi-Fi? 'Sports', 'Music' and 'TV Plus' will offer personalised content based on your preferences and attempt to drag you away from your set-top box and back to your TV's interface. Samsung will launch three personalised TV services at CES 2017 that promise to give viewers content based on their preferences. Called 'Sports', 'Music' and 'TV Plus', the services promise to serve up personalised recommendations based on viewers' viewing habits and chosen preferences. 'Sports', for example, will alert a viewer when their favourite team is playing, tell them which channels/services will show the match, and keep them up to date on the score. All this information will be available in the navigation page, instead of asking the viewers to trawl through multiple pages. 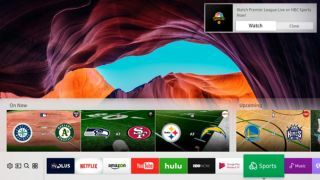 Samsung also plans to expand its range of sports content thanks to deals with content partners like NBC Sports, the UFC and more. UK-specific content deals aren't so clear at this stage. 'Music' will let viewers search and identify songs on live TV or directly from TV shows, a bit like Shazam. It will also recommend tracks in the Preview section. Its music library will include tracks from Samsung's current partners, including Spotify, Napster, Deezer, Vevo, Melon and Bugs. 'TV Plus' - which originally launched in South East Asia and is already available in the US - offers IP-based channels focussing on premium content services. It will offer a new Electronic Programme Guide (EPG), and will come to Europe this year with Rakuten as a partner. We should get a closer look at how these services will work when Samsung launches its 2017 TVs at CES this week.